In honor of the upcoming Military Spouse Appreciation Day on May 12, the StreetShares Foundation is dedicating its Veteran Small Business Award to Military Spouse business owners. Military Spouses give a lot to our country by supporting their spouses while they serve locally or overseas. Military families may receive several Permanent Change of Station (PCS) orders over the lifetime of a military career. And military spouses are the backbones of those families. They’re the ones who are keeping the home and family running. This may be through caring for children, building their careers or starting small businesses. 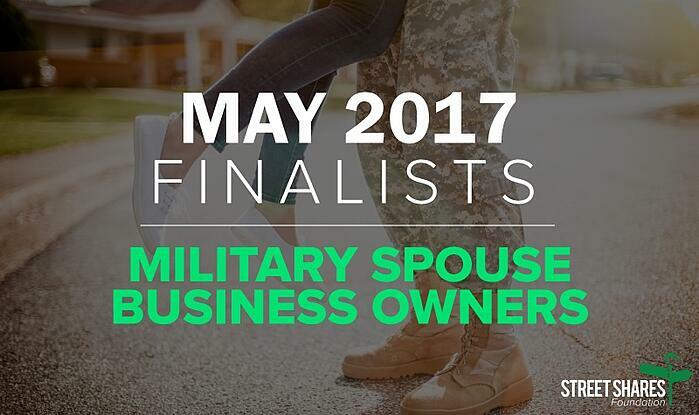 The StreetShares Foundation recognizes Military Spouse business owners by including exclusively Military Spouse business owners in this month’s contest. Check out these amazing businesses and be sure to vote this month. Voting closes at midnight on May 25. Saray Sykes, veteran and military spouse, started At Ease Candles because she was disappointed with wasteful packaging and poor quality candles. She wanted candles that were eco-friendly, made with love and attention to detail. The mission of At Ease Candles is simple, “hand-poured candles made with custom-blended oils, soy wax, and cotton wicks” all eco-friendly components sourced in the USA. Laura and her husband Jeff combined their love of horses with their desire to give back to the military community through a therapeutic horse riding program for veterans dealing with stress or PTSD. Brave HEART (Heroes Equine Adventure & Riding Therapy) is a nonprofit organization and is 100 percent volunteer-run. Civil Sass provides local-grown hops for local microbreweries. In the Chatfield, Minnesota area, there are 15 local breweires within 60 miles. They’re forced to source hops from growers more than 1,500 miles away. Civil Sass hopes to fill that gap. Roanna started making gluten-free baked goods in San Diego after learning her child was diagnosed with severe food allergies. She currently sells baked goods to military base dining facilities, local coffee shops and hotels. Tiffany created Covered Cubs to help parents protect children from strangers. She produces clothing and products with simple messages like, “Please don’t touch baby without permission.” She also offers classes on child protection and child safety. Shelly created functional hair ties for people with long hair who are very active or play sports. FIT TIES is a patent pending product that provides strength and durability with a modern design. All products are made in the U.S.
Brooke co-founded Edge Co-working for military spouses who typically work from home. Military Spouses with PCS-proof careers are what she caters to. These can be anything from entrepreneurs or direct sales professionals. She also maintains a professional development program. HireMadSkills is a network of qualified military spouses looking for employment or to be a remote employee. It’s the only technology solution that allows businesses to outsource directly to a Military Spouse talent community. Successful hires have resulted in long-term employment, contract positions, short freelance gigs, and more. Spousehood is a Christian lifestyle website for military spouses. Grace creates useful, inspirational content and weekly devotionals to help support the military spouse lifestyle. The website also gives freelance opportunities to writers who want to contribute to the Spousehood community. Yoga 4 Change is a nonprofit organization offering yoga for at-risk individuals, who have experienced trauma and extreme stress. They focus on theme-based curriculum and integrates therapeutic writing. Yoga 4 Change has served more than 20,000 individuals in the Jacksonville area in 2016. Congrats to all of the finalists! Learn more about each Military Spouse Business Owner above in their own words and videos. To vote, just enter your name and email address. Thank you for participating and helping them win a veteran business grant to grow their businesses. And good luck to the finalists!